…Jesus took Peter and James and his brother John, and ascending a very high mountain with them apart, showed them the brightness of His glory; because, although they had recognised the majesty of God in Him, yet the power of His body, wherein His Deity was contained, they did not know. And, therefore, rightly and significantly, had He promised that certain of the disciples standing by should not taste death till they saw the Son of Man coming in His Kingdom , that is, in the kingly brilliance which, as specially belonging to the nature of His assumed Manhood, He wished to be conspicuous to these three men. For the unspeakable and unapproachable vision of the Godhead Itself which is reserved till eternal life for the pure in heart, they could in no wise look upon and see while still surrounded with mortal flesh. The Lord displays His glory, therefore, before chosen witnesses, and invests that bodily shape which He shared with others with such splendour, that His face was like the sun’s brightness and His garments equalled the whiteness of snow. 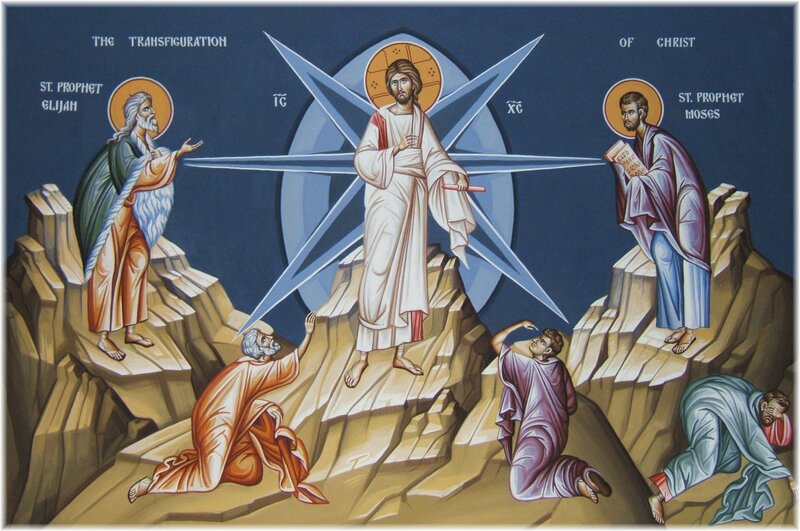 And in this Transfiguration the foremost object was to remove the offense of the cross from the disciple’s heart, and to prevent their faith being disturbed by the humiliation of His voluntary Passion by revealing to them the excellence of His hidden dignity. But with no less foresight, the foundation was laid of the Holy Church’s hope, that the whole body of Christ might realize the character of the change which it would have to receive, and that the members might promise themselves a share in that honour which had already shone forth in their Head. About which the Lord had Himself said, when He spoke of the majesty of His coming, Then shall the righteous shine as the sun in their Father’s Kingdom Mat. 13:43, while the blessed Apostle Paul bears witness to the self-same thing, and says: for I reckon that the sufferings of this time are not worthy to be compared with the future glory which shall be revealed in us Rom. 8:18: and again, for you are dead, and your life is hid with Christ in God. For when Christ our life shall appear, then shall you also appear with Him in glory Col. 3:3 . But to confirm the Apostles and assist them to all knowledge, still further instruction was conveyed by that miracle. For Moses and Elias, that is the Law and the Prophets, appeared talking with the Lord; that in the presence of those five men might most truly be fulfilled what was said: In two or three witnesses stands every word Deut. 19:15 . What more stable, what more steadfast than this word, in the proclamation of which the trumpet of the Old and of the New Testament joins, and the documentary evidence of the ancient witnesses combine with the teaching of the Gospel? For the pages of both covenants corroborate each other, and He Whom under the veil of mysteries the types that went before had promised, is displayed clearly and conspicuously by the splendour of the present glory. Because, as says the blessed John, the law was given through Moses: but grace and truth came through Jesus Christ John 1:17, in Whom is fulfilled both the promise of prophetic figures and the purpose of the legal ordinances: for He both teaches the truth of prophecy by His presence, and renders the commands possible through grace. The Apostle Peter, therefore, being excited by the revelation of these mysteries, despising things mundane and scorning things earthly, was seized with a sort of frenzied craving for the things eternal, and being filled with rapture at the whole vision, desired to make his abode with Jesus in the place where he had been blessed with the manifestation of His glory. Whence also he says, Lord, it is good for us to be here: if you will let us make three tabernacles , one for You, one for Moses, and one for Elias. But to this proposal the Lord made no answer, signifying that what he wanted was not indeed wicked, but contrary to the Divine order: since the world could not be saved, except by Christ’s death, and by the Lord’s example the faithful were called upon to believe that, although there ought not to be any doubt about the promises of happiness, yet we should understand that amidst the trials of this life we must ask for the power of endurance rather than the glory, because the joyousness of reigning cannot precede the times of suffering. cloud, saying, This is My beloved Son, in whom I am well pleased; hear Him. The Father was indeed present in the Son, and in the Lord’s brightness, which He had tempered to the disciples’ sight, the Father’s Essence was not separated from the Only-begotten: but, in order to emphasize the two-fold personality, as the effulgence of the Son’s body displayed the Son to their sight, so the Father’s voice from out the cloud announced the Father to their hearing. And when this voice was heard, the disciples fell upon their faces, and were sore afraid, trembling at the majesty, not only of the Father, but also of the Son: for they now had a deeper insight into the undivided Deity of Both: and in their fear they did not separate the One from the Other, because they doubted not in their faith. That was a wide and manifold testimony, therefore, and contained a fuller meaning than struck the ear. For when the Father said, This is My beloved Son, in Whom, etc., was it not clearly meant, This is My Son, Whose it is to be eternally from Me and with Me? Because the Begetter is not anterior to the Begotten, nor the Begotten posterior to the Begetter. This is My Son, Who is separated from Me, neither by Godhead, nor by power, nor by eternity. This is My Son, not adopted, but true-born, not created from another source, but begotten of Me: nor yet made like Me from another nature, but born equal to Me of My nature. This is My Son, through Whom all things were made, and without Whom was nothing made because all things that I do He does in like manner: and whatever I perform, He performs with Me inseparably and without difference: for the Son is in the Father and the Father in the Son , and Our Unity is never divided: and though I am One Who begot, and He the Other Whom I begot, yet is it wrong for you to think anything of Him which is not possible of Me. This is My Son, Who sought not by grasping, and seized not in greediness , that equality with Me which He has, but remaining in the form of My glory, that He might carry out Our common plan for the restoration of mankind, He lowered the unchangeable Godhead even to the form of a slave. Hear Him, therefore, unhesitatingly, in Whom I am throughout well pleased, and by Whose preaching I am manifested, by Whose humiliation I am glorified; because He is the Truth and the Life , He is My Power and Wisdom. Hear Him, Whom the mysteries of the Law have foretold, Whom the mouths of prophets have sung. Hear Him, Who redeems the world by His blood, Who binds the devil, and carries off his chattels, Who destroys the bond of sin, and the compact of the transgression. Hear Him, Who opens the way to heaven, and by the punishment of the cross prepares for you the steps of ascent to the Kingdom? Why do you tremble at being redeemed? Why do you fear to be healed of your wounds? Let that happen which Christ wills and I will. Cast away all fleshly fear, and arm yourselves with faithful constancy; for it is unworthy that you should fear in the Saviour’s Passion what by His good gift you shall not have to fear even at your own end.